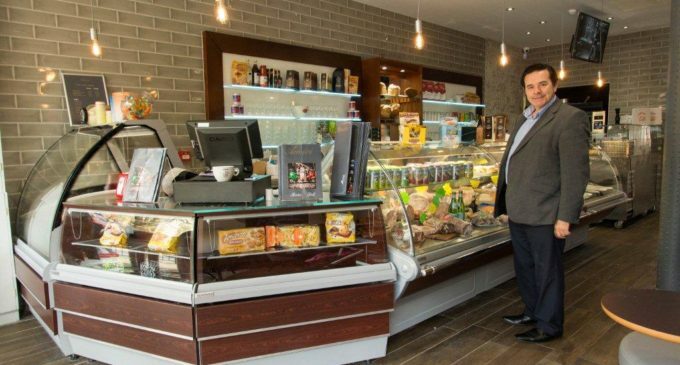 A family-owned Italian restaurant and delicatessen in Bearsden has benefitted from a top quality fit-out by catering equipment specialists Quality Equipment Distributors (QED). Providing over-the-counter cooked meats, cheeses, cakes and other delicacies, along with pizzas, salads and fresh Italian coffee, Amici di Carlo is the brainchild of Scottish-Italian restaurateur, Carlo Andreucetti. ‘After being away from the restaurant business for some time, my partner and I decided to design a new outlet majoring on good quality, fresh Italian ingredients that local people could enjoy throughout the day,’ he says. ‘We came across a former bakers’ café premises near Bearsden Cross and set about transforming it into an authentic Italian dining experience earlier in 2017. According to Carlo (pictured above), the final result combines Italian warmth and hospitality with the latest technology to create a unique venue that reflects their personalities. Managing the building refurbishment, shop-fitting, electrical and plumbing work, including lighting, air conditioning and toilets, QED also supplied and installed refrigerated display counters, back bar coolers, shelving and an ice cream servery counter. The kitchen equipment included dishwasher, glasswasher, storage refrigeration, pizza oven, pizza prep table, saladette, cooking suite, extraction, hygienic wall cladding and safety flooring. Based in Glasgow, QED is a leading UK designer and supplier of modular bar, coffee shop and foodservice equipment for catering and retail environments. For more information on how QED can transform your catering or foodservice business, visit www.qualityequipment.co.uk.